Alma Cocina, located downtown in the 191 Building on Peachtree next to the Ritz and just south of Hard Rock Cafe, quickly won my heart when they opened in December. I have to admit up front, I’ve never been much of a tequila drinker. I also have to say that I try to avoid the downtown convention strip of chain restaurants designed to lure in tourists for a mediocre dining experience. 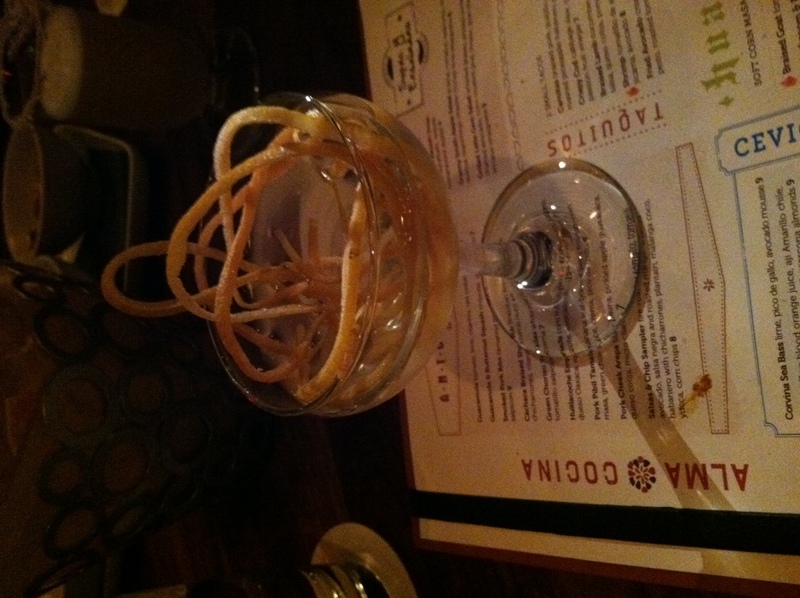 So when we made our first (of now four) visits to Alma Cocina, I was initially hesitant. This latest venture from Fifth Group lives up to the reputation of the company’s other successful ventures. The atmosphere is warm, inviting, and comfortable. The three woody dining areas and the bar are also conversation-friendly. Even with background music, you don’t have to yell across the table to be heard. The staff is incredibly accommodating and welcoming. 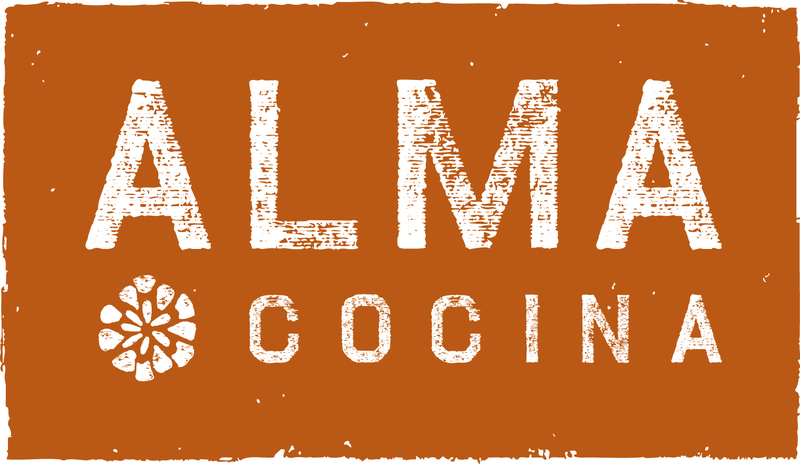 Alma Cocina’s fresh ingredients and regional flavors bring a new contemporary feel to traditional Mexican cuisine. Most dishes are served small plate so sharing is encouraged. We won’t go into detail on the food menu except to say it was all well received by our table. Lots of new favorite dishes! Most important to us are the fabulous and creative cocktails. The treatment of tequila throughout the menu is innovative and impressive. From fresh fruit and Tiki-style, to smoky and spicy, there is a tequila drink on the menu for everyone. Having enjoyed several tobacco-infused bourbons and ryes, I was anxious to sample a tobacco-infused tequila. 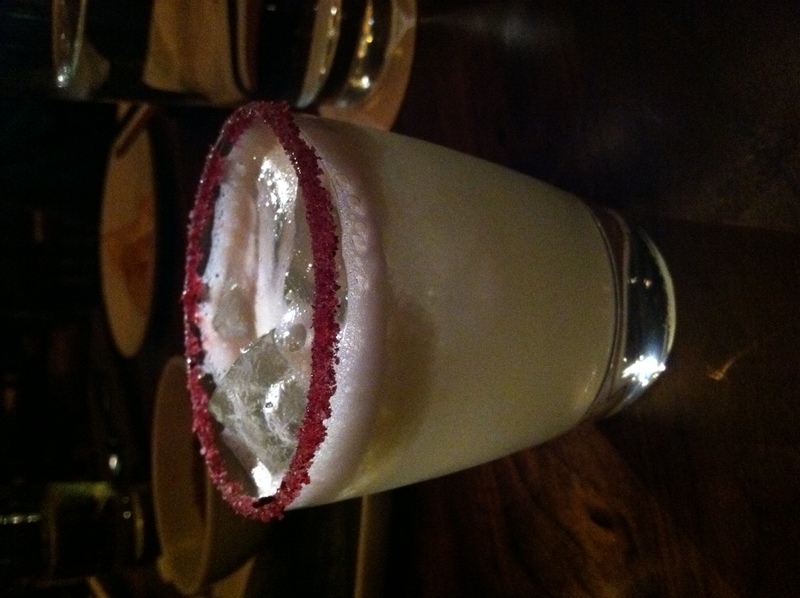 This infusion is blended with vanilla brandy, Del Maguey Crema, pineapple juice, salty saffron, and a salted rim. The initial flavor is a soft tobacco smoothed out by the vanilla and balanced with the pineapple. I had a difficult time distinguishing much of the saffron. It was nice that the smoky flavor seemed to build closer to the bottom of the glass. 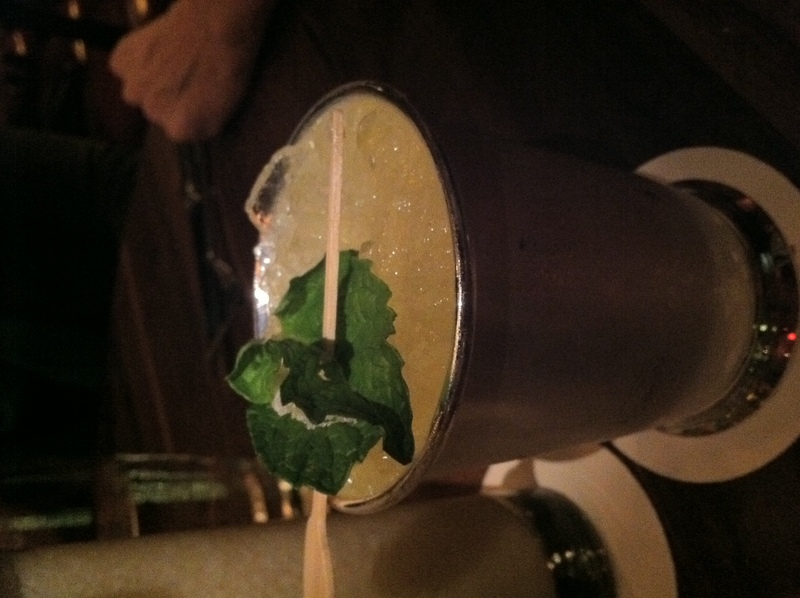 I enjoyed this cocktail two more times on following visits. I’m pretty sure this was our favorite drink, or at least my favorite drink of the night. Smooth Herradura silver tequila plus Poire William liqueur, jalapeno and cucumber play so well together in this creation. The pear provides the right amount of subtle sweetness to balance out the ingredients. It is served in a glass beautifully rimmed with a red hibiscus salt made in-house. I love a good cachaca cocktail. This one is exceptionally good. The Leblon cachaca is paired with strawberries, ginger, and hand-squeezed lime juice. The flavor of the cachaca and lime is really nice. There is a slight sweetness from the strawberries, but the strawberry and ginger flavors are downplayed. On the other end of the spectrum is the tongue-in-cheek salute to Tiki drinks. 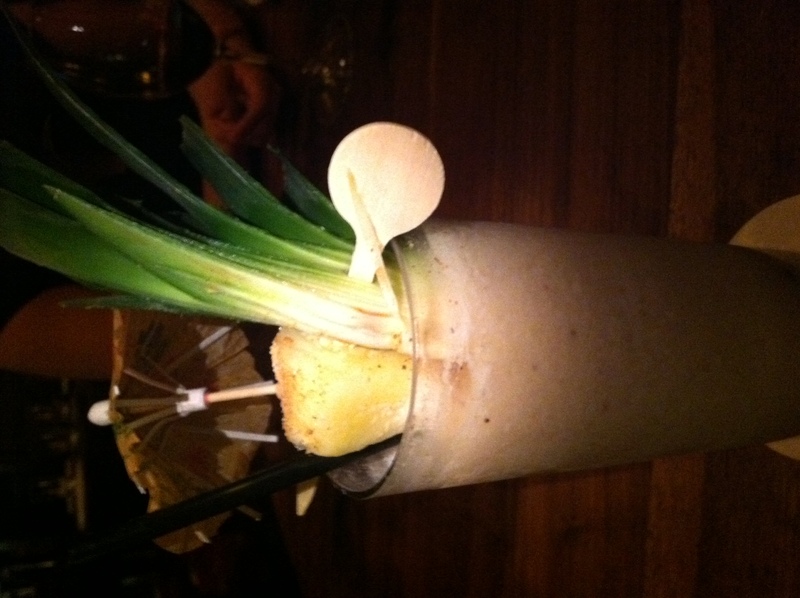 The base is a house-infused ginger rum coupled with a secret colada mix. The cocktail is served blended and in a tall glass of crushed ice adorned with lots of fruit, greenery, and the required tacky umbrella. It is a deliciously sarcastic drink that hints at cardamom, cinnamon, ginger and other notes of Christmas. Hmm. A Christmas Tiki drink. I like it. This creation is somewhat of a nod to the Moscow Mule. Herradura Reposado and Fidencio Mezcal are mixed with fresh ginger and a touch of chamomile aromas. The drink is served in the traditional style of a Moscow Mule but in a pewter cup instead of copper. Nicely balanced and a touch of the smoke from the mescal. This was a great combination – Fidencio Classico mezcal, house-made pomegranate molasses, house-made ginger elixir. Yep. It works. It works really well. Of all of the cocktails we tasted, this was the strongest and most liquor-forward in taste. While I liked it, this one will not appeal to everyone. The flavor profile is as abstract as the presentation of the drink itself. The recipe calls for Beefeaters gin, Del Maguey Mezcal, and Herradura Reposado. Sort of a Mexican martini? 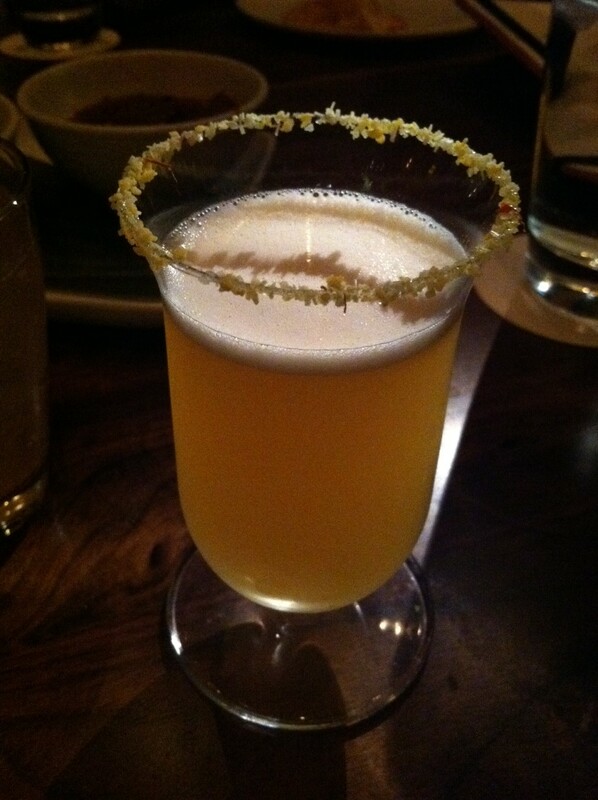 The drink is garnished with an aromatic nest of grapefruit peel. Beautiful to admire, but somewhat difficult to maneuver. 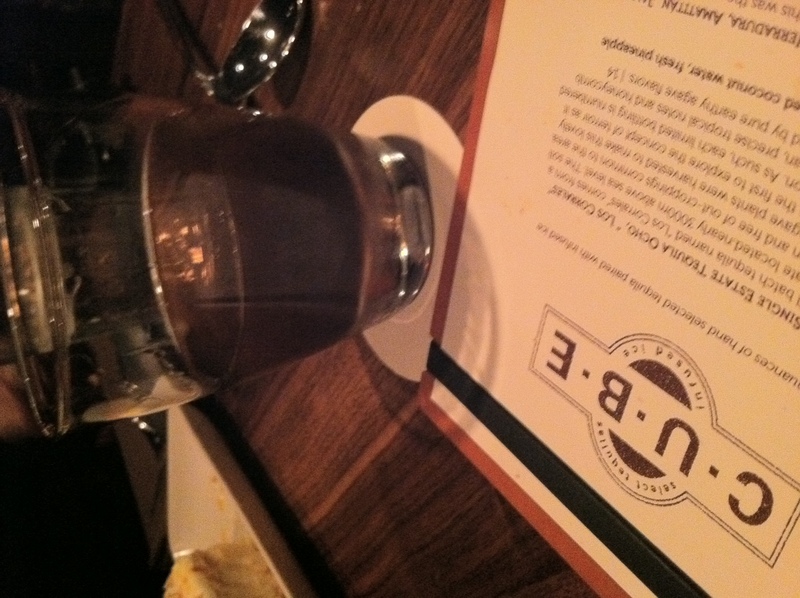 There was no way to leave without sampling the one bourbon drink on the menu. So glad I did. Woodford Reserve, Rothman’s Orchard Apricot liqueur, pineapple juice, Falernum, demerara syrup, and island bitters. What stood out was the combination of the pineapple and the bourbon. The other ingredients enhanced and brightened up the cocktail. Really refreshing and light for a bourbon-based drink. My first cube drink was at another Fifth Group restaurant, Ecco, and involved saffron gin and habanero syrup/saffron ice cube. The idea is to take a flavor packed ice cube and pour a spirit over it. As the cube melts the flavors blend and the taste is constantly changing. You can be patient and let it dissolve on its own, or use the small spoon provided to chip away at the cube. Either way it is a great concept and fun for those of us who are attention-challenged and like to play with our drinks. Alama Cocina offers three of the Cube drinks, all served from the dessert menu as after dinner drinks. 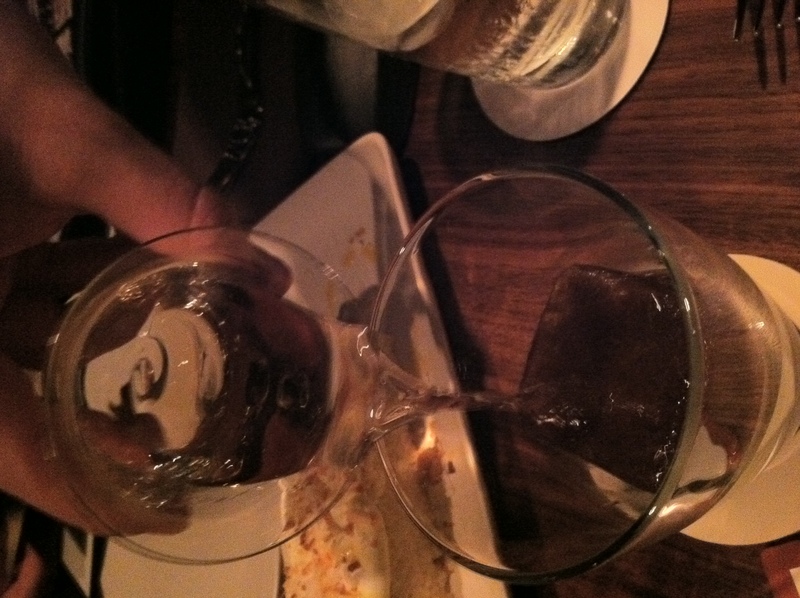 I opted for the Anejo: Tequila Don Julio with a cube of coffee, maple, and caramel. This smooth tequila is rich with flavors of butterscotch, orange, and honey. It marries well with the coffee-maple-caramel cube. The perfect dessert for me! We’ve paid several visits to Alma Cocina in the three months. The quality of the food, cocktails, service is excellent and remains consistent. Looking forward to more evenings here and creative cocktails. really expect to see it for ourselves. ame niche. Your blog providded us useful information to work on. prestigious jobs with which the rest of the labour market cannot compete. from proprietary databases, primary and secondary research and in-house analysis by GBI Researchs team of industry experts.